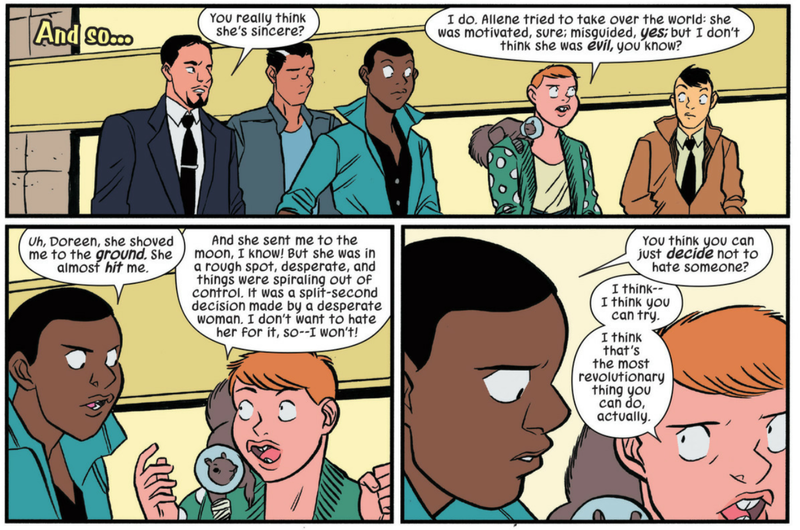 Spoilers for Unbeatable Squirrel Girl Beats Up the Marvel Universe, the source of this week’s image and topic. It’s pretty great. I love Doreen’s reasoning here. I don’t want to hate someone, so I won’t. Not necessarily because they deserve it but because I do. I don’t like when I’m angry. It doesn’t accomplish anything and it gives other people and situations power over me. That’s not to say anger is never justified or serves a purpose, but once that purpose is served I’d rather not let it keep dragging me down and forcing me to focus on my feelings instead of real solutions. Sometimes, on the right day when I’m doing pretty well, it’s easy to do this. Sometimes not so much. But I can always try. And that’s where revolution starts.